Man cannot live solely on oriental perfumes, though clearly I do my best to try. 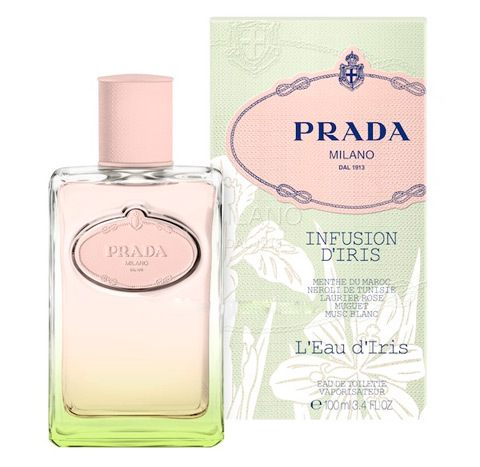 Still, I recently decided to test Infusion d’Iris L’Eau d’Iris, the new flanker fragrance from Prada. The extremely wordy “Infusion d’Iris L’Eau d’Iris” (which I shall call just simply, “L’Eau d’Iris“) is a limited-edition eau de toilette which was released in March 2013 and which seems to be exclusive to a particular retailer in each country. For example, in the U.S., it is Macy’s department store; in Canada, it seems to be Holt Renfrew. Top notes: Moroccan mint, Tunisian neroli. Heart: pink laurel bay, iris, rose, lily of the valley, orange blossom. Base: white musk, woody notes, vanilla. I have absolutely no idea what “pink laurel bay” smells like, and it wasn’t easy to research amidst all the references to regular bay leaves, but “laurel bay” appears to have an almond-like, powdery aroma. And, in truth, that is a large part of this very fresh, clean fragrance. L’Eau d’Iris opens on my skin with a citrus note that has a faintly soapy edge, followed by white musk and hints of powdery iris. A muted touch of rose lurks around the edges, but, like everything else to do with L’Eau d’Iris, it is soft and light. Less than five minutes into the perfume’s development, the iris takes over, the citrus element fades away, and an almond note rises to the surface. It is a little powdery and smells very much like heliotrope, a note often mixed with iris to create a lightly powdered, floral aroma. As many of you know, the smell of an iris can’t be extracted from the petals, so the scent is often recreated through distillation of its root, as well as through the addition of other elements. 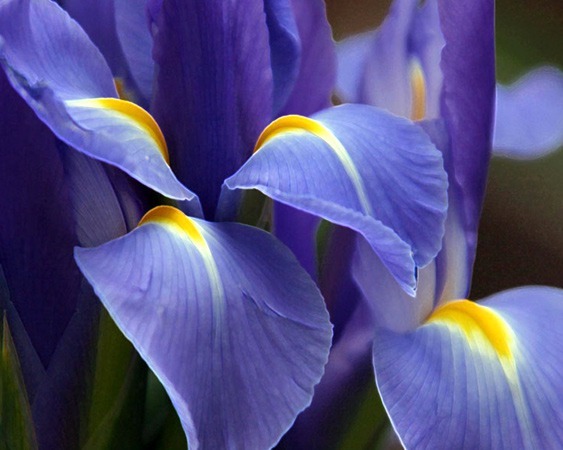 For those of you who are unfamiliar with what “iris” smells like, the note has often been compared to boiled carrots, lipstick, or powdery violets. Sometimes, the smell is slightly rooty, if there is a lot of orris root used in the fragrance, but generally it’s a rather cool, floral note. Here, in L’Eau d’Iris, the aroma is powdery, floral, and a little like that of sweet, boiled carrots. Thirty minutes into the perfume’s development, L’Eau d’Iris shifts a little. For one thing, it becomes a complete skin scent that is much harder to detect. 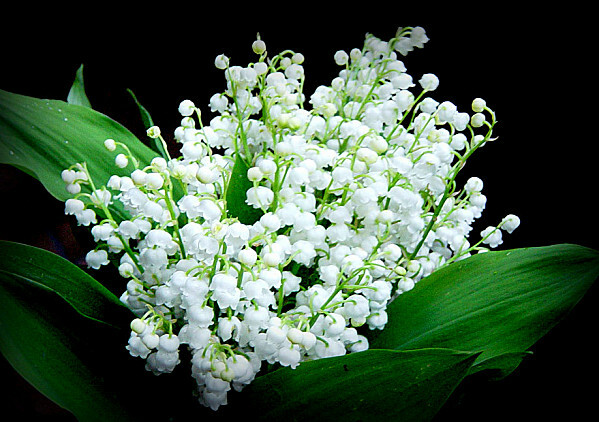 For another, the light, green, lily of the valley note and the whisper of rose that lurked at the perfume’s edges become even more muted. Taking their place is vanilla and almonds. The vanilla note starts off being light, thin and subtle, but it soon grows stronger and combines with the laurel leaf’s almond essence to create L’Eau d’Iris’ second most dominant accord. Other elements start to become noticeable. From the start, there was a light alcohol element lurking at the edges of the fragrance. Midway during the second hour, it grows into something chemical and synthetic that really bothered me and gave me a slight headache. I can’t pinpoint if it stems from the white musk (which is always a synthetic ingredient), or from something else. In addition, the powder takes on a sour nuance that I found unpleasant. The second hour also saw the emergence of an amorphous, vague “woody” undertone that was very beige and slightly synthetic. It makes the iris note feel a little more rooty and dry, less purely floral; it also helps to cut through the vanilla and almond. As a whole, L’Eau d’Iris was primarily a simple fragrance of powdered iris, vanilla, and clean musk. There are tiny flickers of muguet (or lily of the valley) that lurk in the background, but they are always very subtle. Equally subtle is the light soapiness underlying the scent; it’s almost more of an indirect thing that simply adds to the overall impression of a fresh, clean scent. In its final moments, L’Eau d’Iris was a sheer, abstract, lightly powdered, floral, iris fragrance with a subtle carrot-like nuance, soapy musk, and the merest suggestion of woodiness. At no time did I smell mint, orange blossom, or neroli. 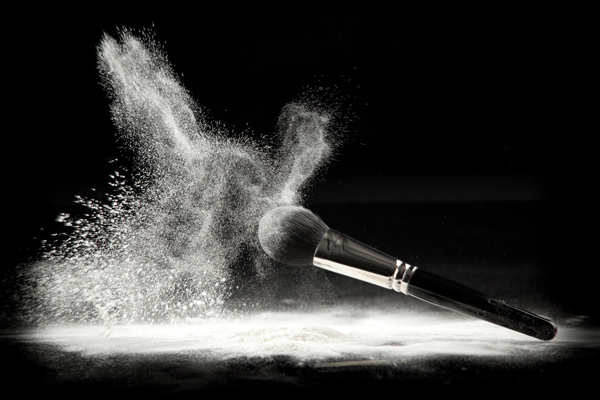 On occasion, the fragrance did evoke the scent of makeup powder. All in all, L’Eau d’Iris lasted just short of 5.5 hours on my skin, with moderate sillage at first that quickly dropped even further to become a virtual veil on the skin. At times, it was extremely hard to detect in its sheerness and lightness. I realise that L’Eau d’Iris is meant to be a light “eau” version of an eau de toilette, but I’m not the only one who thought the scent was extremely weak. The pink laurel carries an almond hint, while the iris is clearly powdery-floral. […][¶] Pleasantly powdery with a high floral note, I could barely discern the mint of Morocco (meant to illuminate the composition) whose faint whiff edges the scent. When I first learnt of this fragrance, I was intrigued and pleased by the unusual inclusion of the mint. I’d expected its presence to be more apparently – intrusive, even – so the barely-there nature was a bit of a disappointment. Still, it’s nice to have this lively sprinkle. Unfortunately, the scent disappears very quickly. In this aspect, it surely lives up to its ephemeral inspiration. While it is an agreeable scent and very likely a crowd-pleaser, it is more fleeting than I’d expected it to be. The brand depicts it as being ‘transient yet unforgettable’ but the latter part is hard to live up to, if the fragrance doesn’t last long enough for me to grasp its essence. In my many days of using it, it’s still hovering on the periphery of memorable. Perhaps a scent memory moment will hit me one day and it’ll finally be of recollective substance. I didn’t smell mint at all, but I completely agree on the gist of her review: L’Eau d’Iris has a pleasant, transient and wholly forgettable nature. On Fragrantica, in contrast, there is quite a bit of love for L’Eau d’Iris. And, in fact, a lot of people detected the mint note, with one commentator writing: “This is too boring. It’s fresh, sweet and minty. The most dominant notes are iris and mint.” There seems to be a split on another issue, namely the soapiness. One person called L’Eau d’Iris “the soapiest perfume I have ever smelled,” though she loved it. Another said it was not as soapy or dry as the original, Infusion d’Iris, but more floral and green. One couldn’t stand the sour baby powder note that she detected, while another loved all the powder. But no-one talked about orange blossoms or neroli. I have to say, I have a loathing of extremely soapy fragrances, but I thought the note was quite manageable in L’Eau d’Iris. I struggled much more with the synthetic white musk. This is my new Spring in a bottle! It is soft pastels and delicate pink petals all riding on a fluffy, powdery cloud! The iris is just as beautiful as ever, but it is definately a light-as-a-feather soft pastel iris. […] The mint is light, but it is always there, all the way through the drydown, which is simply sublime. The drydown is probably my favorite part. It is so soft and angelic, like angels’s wings. […] I must say that midway through this perfume has to be the soapiest perfume I have ever smelled…then the lovliest iris blooms at the end in the most romantic way. Beautiful. I can completely see how someone who adores fresh, clean, soft florals might view the fragrance that way. At the same time, I have to caution those who may not be a fan of powdery fragrances, especially as the note turned a little sour on someone other than myself. And if you’re looking for a perfume with sillage, forget about it! I’m trying to be fair to L’Eau d’Iris, but I really don’t think it’s particularly special or noteworthy. However, if you love Prada’s hugely popular original, Infusion d’Iris, or if you love powdery, clean scents in general, then it is probably worth a sniff. Cost & Availability: Infusion d’Iris L’Eau d’Iris is a Limited Edition Eau de Toilette. It is only available in 3.4 oz/100 ml. In the U.S.: the fragrance is exclusive to Macy’s where it retails for $77. Macy’s has free domestic shipping on orders over $50. Nowhere else will sell this particular, limited-edition flanker — not Nordstrom, not Sephora, not Neiman Marcus. Also, I don’t know for how long this perfume will be available, or whether it will be common to all Macy’s brick-and-mortar stores. Outside the U.S.: In Canada, I’ve read that the perfume is available at Holt Renfrew. For other countries, I honestly have no clue where L’Eau d’Iris may be sold. It seems to be exclusive to one retailer in each country. Oddly, I don’t see it listed even on Prada’s own website. It has to be available in Prada boutiques, however, so you may want to check the Store Locator guide on the company’s website or to call one of their stores near you. Samples: The Perfumed Court sells samples starting at $3 for a 1 ml vial.